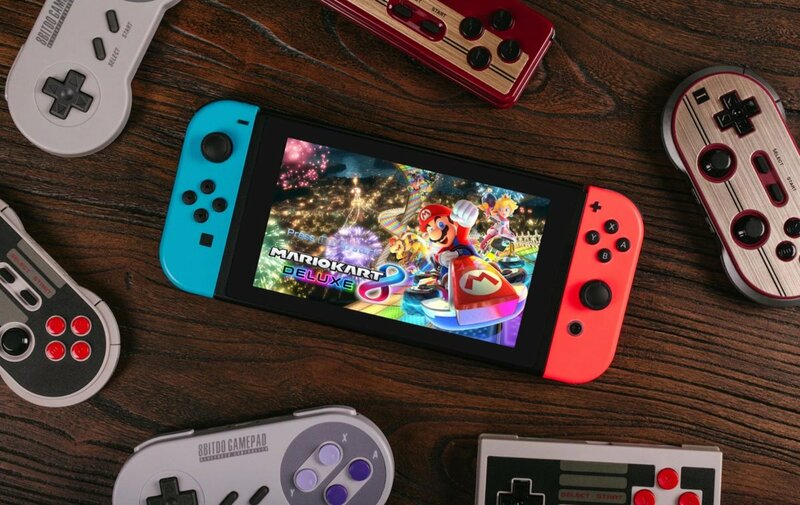 There's good news on the horizon for fans of 8bitdo's clasically-styled controllers: thanks to a new firmware update from the company, most of 8bitdo's Bluetooth wireless controllers are now compatible with the Nintendo Switch. Many of their controllers, such as the NES-inspired NES30 and NES30 Pro, have long been the must-have wireless gamepads for players with a taste for throwback-inspired style, and with the new firmware, they're now a stylish and considerably less-expensive way of playing Nintendo Switch titles with a more traditional gamepad. • First, make sure your 8bitdo controler is one of the compatible models. These chiefly include the FC30, FC30 Pro, NES30, NES30 Pro, SFC30, and the SNES30. • Next, head over to the 8bitdo Support page, click on the Firmware icon, locate the listing for your controller, and click to download the new Firmware v4.0 file. • Open or extract the ZIP file to any convenient location -- the desktop works well for this. Then, open the Update Tools folder, navigate to the Windows or Mac folder depending on your operating system, and then double-click on the appropriate executable file; it'll be named 8bitdo_Update. • As instructed by prompts, pick up your controller and hold the Power and Pair buttons together to force the controller to enter Firmware Upgrade Mode. • Connect a Micro USB cable to the controller and then to the PC. • Click on USB Upgrade within the 8bitdo_Upgrade installation program and search for the NES30pro+FC30pro_Firmware_V4.00.dat file. It will be in whichever directory you unzipped the firmware file to. • From here, let the update application work its magic. All that should be left to do is wait for the program to complete its task, then unplug and restart the controller. Thankfully, connecting the 8bitdo controller to the Nintendo Switch is a much less involved process than the firmware upgrade. Simply press and hold Power and Y together for one second to power on the controller, then press and hold Pair for two seconds to enter pairing mode. Once the blue LEDs begin to blink rapidly, head over to the Switch's Bluetooth settings page and pair the controller with the system. The blue LEDs will turn solid once the connection has been successfully established. Looking for more must-have Nintendo Switch accessories? We've got a fine selection of durable and protective coverings featured on our list of the Best Nintendo Switch Cases.